Apapa Port workers union shut down business in protest against the proposed amendments to the Nigerian Port Authority Act. Practically the heart beat of Nigeria's economy has been paused! Commercial activities at Nigeria's biggest port, Apapa Port were on Tuesday paralysed as port workers blocked all the entrances to the facility. 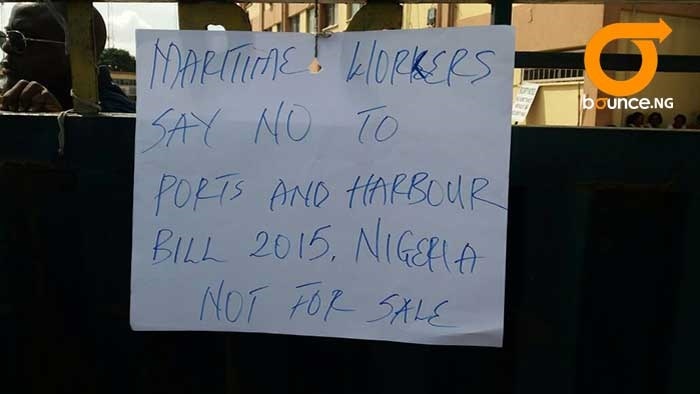 The protests were jointly organised by the two unions in the maritime industry, the Maritime Workers Union of Nigeria (MWUN) and the Senior Staff Association of Communications, Transport and Corporations (SSACTAC), Maritime Branch. The workers are protesting against the proposed amendments to the Nigerian Port Authority Act. The decision to embark on the mass protest was because there had been no response from the National Assembly since the two unions wrote a letter in June opposing some sections the Ports and Harbour Bill. The protest was to force the hands of the National Assembly to rescind its decision on the amendment. Already, the Ports and Harbours Authority Bill, 2015 which seeks to repeal the Nigerian Ports Authority Act 1955 as amended, has been passed by the Senate and is awaiting the concurrence of the House of Representatives. The bill was sponsored by a member of the House of Representatives, Hon. Nicholas Ossai. MWUN and SSACTAC had petitioned the Speaker of the House of Representatives over the bill, saying that it would lead to massive job losses for NPA workers. The unions also pointed out several economic and security implications of the bill if passed. Bounce News correspondent at the port reports that businessmen and women have been left stranded outside the premises. It was also gathered that the protests took place simultaneously in all the seaports in Port Harcourt, Onne, Warri and Calabar.